In spite of the overall safety of the U.S. food supply, each year millions of people get sick from the food they eat. The symptoms of foodborne illness include diarrhea, vomiting, and sometimes fever. These conditions can be disabling for some people, but are more likely to be devastating and even deadly for vulnerable populations. Major surgery or some cancer treatments. Decreased stomach acidity creating a more neutral environment in which harmful bacteria can survive and increasing the likelihood of foodborne illness. Slowing down of the digestive processallowing time for more rapid growth of pathogens in the gut. Malnutrition increasing the risk of infections. The onset of symptoms can vary from as short as one hour after consuming the contaminated food to as long as a few days. If you suspect that a participant has foodborne illness, treat these symptoms much like you would treat the flu. If the person has a chronic illness or has very severe symptoms, contact a health care provider as soon as possible. Foodborne illness can happen when food becomes contaminated and/or when microbial growth is allowed to occur in food. Any food or beverage can become contaminated. However, certain foods are considered to be more risky because they support the growth of pathogens or have been involved in foodborne illness outbreaks. raw, washed, cut fruits and vegetables. whole raw fruits and vegetables that can be eaten without peeling. meat, dairy products or other high protein foods that have already been cooked or other foods that can be eaten without washing or cooking. These foods may carry microorganisms or other contaminants that can make people sick. Additional safeguards prohibit re-serving foods. For more information about these restrictions, check with your local health inspector or contact the state Department of Public Health. Contamination occurs when something harmful gets into the food. Bacteria or other harmful substances can travel to food by hands, equipment or utensils used to prepare food. Physical contaminants can be seen or felt. They include dirt, broken glass or plastic flatware, toothpick, hair, fingernail, or bandage. Cleaning chemicals, sanitizing agents Chemicals used to clean and sanitize pots, pans or dishes can be a source of chemical contamination if proper cleaning procedures are not followed. If too strong a concentration of sanitizer is used, consumers can get sick from the residue left on the food contact surface. Toxic metals are poisonous compounds that form when high acid foods like citrus or tomato products are left in metal cans or containers. Pesticides that are not used properly can leave residues on foods or food contact surfaces. To keep food safe, read labels and follow the directions on any chemicals or pesticides. Biological contamination comes from micro-organisms that occur naturally in some foods or are introduced through cross-contamination with other foods or food contact surfaces. While chemical and physical contaminants can make people sick, it is most often microorganisms that cause foodborne illness. Molds and yeasts usually cause food to spoil. However, molds can be dangerous because they may produce toxins that can make elderly and other susceptible populations ill. These poisons are not removed when mold is cut off foods like cheese, fruit or breads. Parasites have been found in foods produced or processed with contaminated water or handled by people who do not practice good personal hygiene. Viruses are a major cause of foodborne illness. Most of these viruses are carried to people by foods that have been touched by people who are ill with the virus. Bacteria cause most cases of foodborne illness. The FDA “Bad Bug Book” (www.cfsan.fda.gov/~mow/intro.html) provides basic information about dozens of microorganisms and the illnesses they cause. While bacteria and other microorganisms are common in the environment, in people, and in or on food, most of them are not pathogenic. However, when they are allowed to grow to harmful levels, or if they are from virulent strains, older adults can become sick. Food becomes unsafe when bacteria and other pathogens grow to harmful levels. With the right components (protein and moisture) and warm enough temperatures, bacteria can multiply in relatively short periods of time. Temperatures between 41°F and 140°F are considered the “Danger Zone” because bacteria will grow well in this range, with the most rapid growth between 70°F and 110°F. When foods are left in the Danger Zone for more than 2 hours, the number of bacteria can increase to harmful levels. Neither refrigerator nor freezer temperatures kill bacteria – they just slow down the rate of growth. Bacteria remain alive and viable in the freezer (0-32°F). In the refrigerator (41°F or below) bacteria survive and grow slowly. Some bacteria such as Listeria and certain types of E. coli grow well even in the refrigerator. Only temperatures above 140ºF will kill bacteria. Habits as simple as washing hands and keeping things clean will help keep pathogens and other contaminants from spreading to food. Practice Good Health and Hygiene: Humans are the source of many microorganisms that cause foodborne disease. Some bacteria are found naturally on our skin, hair, nose and throat. Many others live or survive in our intestines. These bacteria can easily be spread from one person to another by hands touching foods, food contact surfaces and other household objects like faucets or tables. Improper or inadequate handwashing is a major cause of foodborne illness. 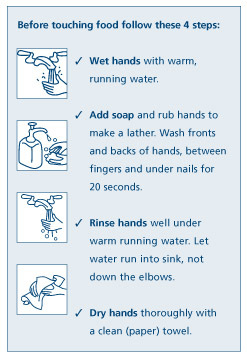 Washing hands can remove bacteria and other pathogens. Keep Food Contact Surfaces Clean: Cross-contamination occurs when bacteria spread from one food to another. Prevent cross-contamination by keeping foods – especially raw PHFs – away from ready-to-eat foods. Food contact surfaces are any items that touch food such as cutting boards, can openers, dishes, kitchen utensils and counter tops. When they are washed the “soil” (dried gravy, sauces and food) is removed. Sanitizing adds another step to reduce bacteria to levels where they are no longer harmful. Approved methods for sanitizing include heat or hot water, and chemicals such as chlorine bleach or quaternary ammonium compounds (quats). The concentration of this solution will yield 50-100 ppm (parts per million). The maximum amount of chlorine allowed to sanitize food contact surfaces is 200 ppm; 50 ppm (less than a teaspoon per gallon) is the minimum concentration recommended. If more than the 200 ppm is used, a chlorine residue will be left as a potential source of chemical contamination. To prevent chemical contamination, use a test strip for the sanitizer to check the concentration of the sanitizing solution. Keep food safe from contamination at all steps in handling. Report illnesses or symptoms like diarrhea or nausea before they work with food. Cover any cuts, burns, sores or skin infections completely with a bandage if they prepare or serve food. 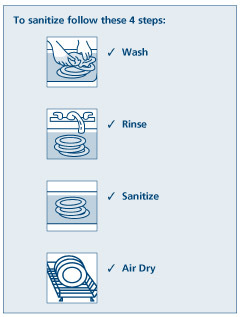 Wash hands before handling food or touching clean dishes. Establish policies and procedures for practices listed below. Check packages for tears or leaks. Make sure cans are free from dents and bulges. Store food away from cleaning supplies and other chemicals. Wrap raw meats and poultry or put in containers or dishes. Place below other foods – on the bottom shelf or drawer of the refrigerator. Store food only in containers designed for food. Do not store poison or cleaning chemicals in food containers. Throw away moldy cheese, bread or fruit, fermented juices. Use disposable gloves, mixing spoons and serving utensils to make and serve food instead of using your hands. Wash fruits and vegetables before you serve them. Wash, rinse and wipe tops of cans before opening. Use different cutting boards for raw meats and ready-to-eat foods. If you can’t use separate utensils after they come in contact with raw meat, poultry or fish, then wash and sanitize them. Put cooked meat, poultry or seafood on a clean or different plate than you used for the uncooked foods. Use a clean spoon if you taste foods as you prepare them. Don’t mix (or store) old and new batches of the same food. Insects and rodents are also sources of contamination. It is important to keep flies, cockroaches, mice and rats away from the food preparation and storage areas. Keep pests out. Put screens on doors and windows. Keep trash cans covered. Keep the kitchen and eating area clean. Clean food crumbs and wipe up even small spills. Use pesticides only if they are absolutely necessary. Store these like any other chemicals away from food in a locked cabinet. Follow the manufacturer’s directions for use. To control these pests: Throw out any food that shows signs of pest infestation, or has contacted a surface that was contaminated with pesticide. Time and temperature play important roles in the growth of bacteria. By controlling the temperature of foods, and limiting the amount of time foods spend in the Danger Zone, you can help prevent bacteria from growing to harmful levels and producing toxins. Use a food thermometer to check internal temperatures of foods. Insert the tip of the thermometer into the thickest part or middle of the food. Wait for the temperature reading to be steady (at least 15 seconds). Sanitize the thermometer between uses to prevent cross-contamination. Calibrate the thermometer regularly to insure its accuracy. Keep cold foods cold (41°F or below) at all steps in handling. Buy cold or frozen items last. Check to make sure frozen foods are frozen and cold foods have been kept at 41°F or below. If you shop for food, pack cold foods in insulated containers when the weather is warm. Set your refrigerator no higher than 41ºF and your freezer at 0ºF. Place a refrigerator thermometer in the middle of the refrigerator or freezer. Check the temperature of your refrigerator each day. Put away potentially hazardous foods into the refrigerator or freezer first. Put raw PHFs in the back of the refrigerator where it is coldest. Use the refrigerator door for condiments and other foods such as jams and juices. Store eggs in their original carton in the refrigerator – not on the door. Make sure the vents in these appliances are not blocked so that cold air can circulate. Don’t overstuff the refrigerator. In the refrigerator: Place frozen meat or other PHFs in a pan or tray below ready-to-eat foods. Plan for enough time for the size of the item. For example, one pound of ground beef or a thin chicken breast may take less than a day to thaw while a 10 pound turkey may take 4-5 days. After thawing, use or cook meats within 1-2 days. In cold running water: Make sure that the food is sealed in a package or bag. One pound of ground meat will take about one hour. For a whole turkey, plan on 30 minutes per pound. It is best to use this method if the food item can be thawed within 2 hours. Foods thawed using this method must be cooked immediately. In the microwave: Always cover the food to prevent juices from contaminating the parts of the microwave oven. Follow the directions for the microwave, rotating the food several times to make sure it thaws evenly. Foods thawed this way must be cooked immediately. Some frozen foods like frozen vegetables and thin foods such as hamburger patties, fish portions and shaved steak, can also be thawed as part of cooking. Always cook thawed foods thoroughly before refreezing. Do not thaw foods at room temperature. The outside of the food may reach temperatures above 41ºF while the inside is still icy. Bacteria on the surface may grow to harmful levels. Chill ingredients before mixing. Refrigerate ingredients such a mayonnaise, tuna or other ingredients for salads before mixing. Marinate meats in covered containers in the refrigerator. Keep foods refrigerated at 41ºF or below until just before serving. Check the temperature of the foods to be 41ºF every 2 hours. Throw away any food that has been above 41ºF for more than 2 hours. Use ice and insulated containers to transport foods when taking a trip or outing. Divide large amounts of leftovers into small, shallow containers. Set large pots of soup, stew or sauce in an ice bath. Don’t pack the refrigerator. Make sure there is room for cool air to circulate and keep foods at a safe temperature. Keep hot foods hot at all steps in handling. Use a food thermometer to check the temperature of foods to make sure that they are cooked thoroughly and held at the proper temperatures. Be careful not to hit fat or bone in meats. Check the temperature of the foods to be 140 ºF or above. Refuse foods that are below this temperature. Do not interrupt cooking times. Partial cooking can raise temperatures to Danger Zone levels without being hot enough to kill bacteria. Follow the minimum internal cooking temperatures recommended in the Food Code. 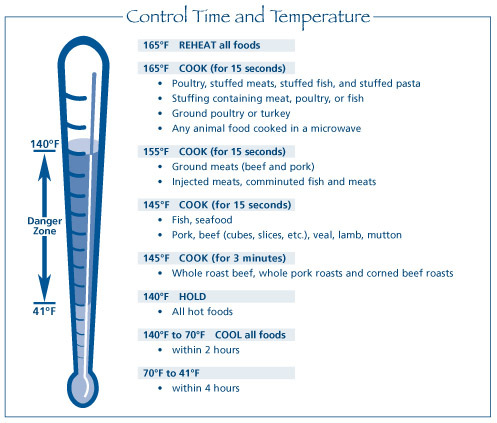 Check the temperature of the foods to be 140ºF or above every 2 hours. Throw away any food that has been below 140ºF for more than 2 hours. Bring gravies, soups and sauces to a boil when reheating. Heat other leftovers to 165ºF for 15 seconds. From FDA Food Code, 1999. For programs that prepare and serve meals and snacks for participants, some states, such as Massachusetts, require that there be at least one person who can demonstrate knowledge of foodborne illness. This regulation often requires that this person has successfully completed a food manager certification exam. Check with your local health inspector to see if this requirement applies to your program. Food safety is everyone’s responsibility. All staff and volunteers should have the opportunity to learn about the risks of foodborne illness and what they can do to prevent it. Materials and training resources are listed the Resources section of this manual. Share this information with caregivers as well. Regulations for food safety and sanitation may change to reflect new food safety issues, scientific evidence and technologies. For information about any changes or new developments, check with your local health inspector or contact the state Department of Public Health.